Prime Minister Narendra Modi contributed two Indian rice seed varieties to the gene bank of the international rice research centre in the Philippines which he said is working towards mitigating global poverty and hunger by improving the cultivation of the key grain. The prime minister visited the International Rice Research Institute (IRRI) in Los Banos, an urban locality situated at a distance of around 65 kms from Manila — the capital of the Philippines — and interacted with a large number of Indian scientists working there. A number of scientists at the IRRI briefed the prime minister on flood-tolerant rice varieties which they said can withstand 14-18 days of submergence and can provide 1-3 tonnes more yield per hectare in flood affected areas. A ‘rice field laboratory’ named after Prime Minister Modi was also inaugurated by him at the institute. He unveiled a plaque marking the inauguration of the Shri Narendra Modi Resilient Rice Field Laboratory. “A contribution from India to IRRI…presented two Indian rice seed varieties to the IRRI gene bank,” the prime minister tweeted. The prime minister also undertook a symbolic groundbreaking for a new plot for submergence tolerant rice varieties. 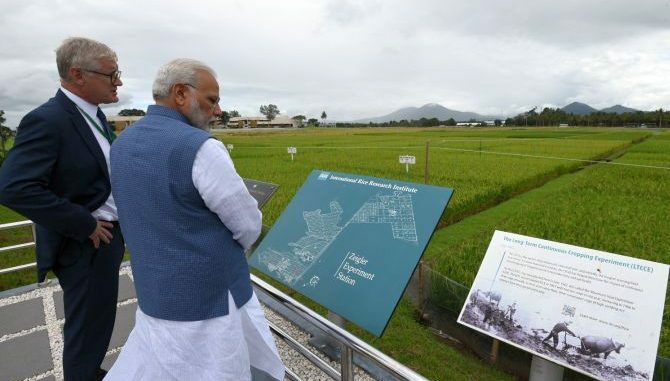 Modi said he saw a detailed exhibition on rice varieties and the impressive work done by IRRI with women farming cooperatives. “My visit to IRRI was a great learning experience. Saw the exceptional work IRRI is doing towards mitigating poverty and hunger by improving rice cultivation. Their work benefits many farmers and consumers, particularly in Asia and Africa,” he said. The IRRI, which has offices in 17 countries, is known for its work in developing rice varieties that contributed to the Green Revolution in 1960s. “The Varanasi Centre would help increase farmers’ income by enhancing and supporting rice productivity, reducing cost of production, value addition, diversification and enhancement of farmers’ skills,” the Prime Minister’s Office tweeted. Spokesperson in the external affairs ministry Raveesh Kumar said the IRRI has successfully collaborated with Indian Council for Agricultural Research (ICAR) to introduce drought- tolerant, flood-tolerant and salt-tolerant varieties of rice in India. “Interacted with Indian scientists, students, researchers working at IRRI. India’s ICAR and IRRI have been cooperating for four decades. India is also involved in helping IRRI in strategic planning, helping decide key goals and working to overcome hunger as well as poverty,” Modi said. Kumar said the IRRI and its partners have provided assistance to 2,00,000 women farmers in Odisha which included providing capacity building programmes, and improved agriculture technology. The IRRI centre in Varanasi will help in utilising the rich biodiversity of India to develop special rice varieties. Modi arrived on a three-day visit to attend the ASEAN-India and the East Asia summits.